Last week I had the privilege of being interviewed by Elise of Global From Home. I’m continually encouraged by her frequent posts reminding me that I can have an international mindset and be open to other cultures even if I’m unable to travel as often as I’d like. What does being global from home mean? Check out Elise’s list of 100 Ways to Be Global from Home. Thanks Elise for a great blog! Here is the interview in which Elise asked some great questions. I wanted to share it with you, my faithful reader, so you can understand a little more about my philosophy of travel. 1. Why do you think it’s important to include your children in your travels? I want my kids to grow up experiencing the unfamiliar and understanding that just because something is new to them or different, it doesn’t need to be uncomfortable, scary or considered inferior to what they know. Experiencing new things should be a normal, desired part of life experience. 2. From your experiences, what are some of the easier places to travel with kids? We don’t usually pick our travel locations based on ease. I could push my stroller down the aisle of the train in Germany, which made traveling in Germany with small children ‘easier.’ We had wonderful kid-friendly travel experiences in Germany utilizing public transport. However, when we visited family in Africa, we took the baby carrier/backpack, knowing the stroller would not be practical. Transport with a baby was not ‘easy’ and required significant pre-planning. But, the people we came across in Africa were so glad to meet our baby and were thrilled when we let them hold and hug her. They were more touched by our willingness to share our precious child with them and come all that way than anyone I came across in Europe. They did not take our effort for granted. In the same way that raising kids isn’t “easy,” traveling with them is also not easy. But we know that raising children and also traveling with them are both extremely rewarding. The positive outcomes outweigh any negative experiences along the way. 3. How does your faith play into how you see the world? My faith is the primary component that impacts how I view the world. People, cultures and geography were created by God to show us some aspect of his nature. The more experiences we have outside of our cultural comfort zone, the more opportunities we have to learn something new about God or have God show us something new about himself. Of course, most people can step out of their cultural comfort zone without spending a lot of money and globetrotting. That why I like your blog, Elise! It’s a good reminder that we can stretch ourselves and seek new experiences without owning a passport. It’s a mindset. 4. Considering all the places you’ve lived and traveled, where do you feel the most at home? Home is wherever we can be together as a family or, as I often say, home is where my toothbrush is. Last summer we spent three months away from our house so we could be together while my husband worked on the east coast of the U.S. I felt more at home in that hotel than if I had stayed at our house on the west coast with the babies (3 months and nearly 2 years old at the time). No matter where we are in the world, when we are together as a family, it’s home. 5. What advice would you give other parents who are about to embark on family travels? – Focus on what is important – time together as a family sharing an experience. If you show up to a museum and it’s closed or a visit to the zoo is cut short because of an ‘accident’ or your hike gets rained out, all is not lost. – Try new, local foods together. You can even do this from home! If it turns out you don’t like what you ordered, you will laugh later about the experience. – Germs are everywhere and are normal – get over it. – Don’t focus on the places, but focus on the people. People matter. And here’s a picture, just for fun. 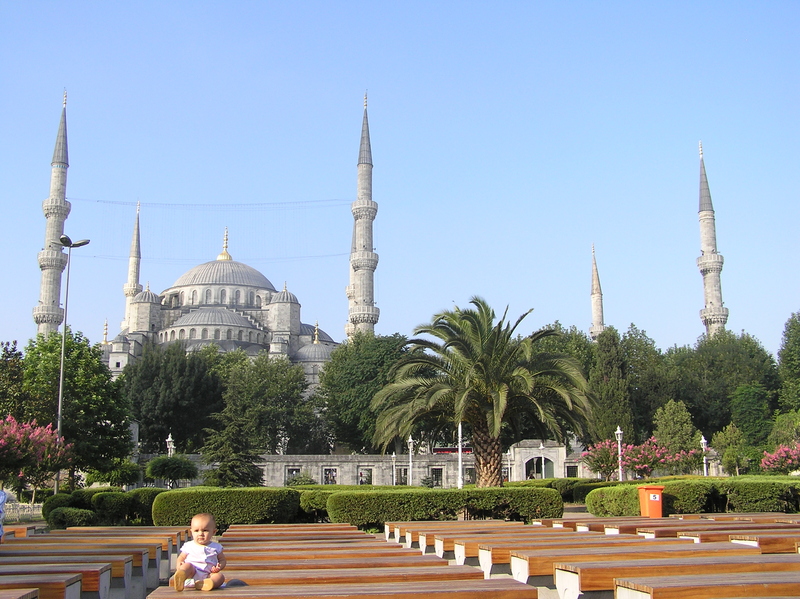 Istanbul’s Blue Mosque – before the hoards of buses and tourists arrived. Turkey is incredible. Take the kids! Great interview, loved the perspective! It is comforting too, to know when it’s time to make the transition from traveling as just us to a family that there are many people who have successfully done it before us! Traveling as a family is so fun if you change your expectations and basically keep expectations low. Then you won’t be disappointed because it will be better than you expected:-) Anything can happen, so you have to go with it. But if your kids grow up traveling and experiencing new things, they’ll thank you for it!